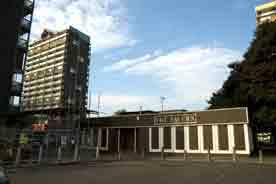 3 Waddell Court, Gorbals, Glasgow. G5 0QA. 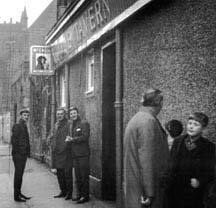 In 1970 big John Adams ran this brilliant Gorbals local known for it's great singers. Well known Glasgow pub musician Frank Hassen was a regular in here entertaining the locals with his keyboard and singing daughters Elaine and Ann. 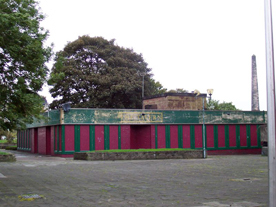 John Adams ran the Tavern in Ballater Street at the corner of Florence Street during the late 1950s, when the pub was demolished at the end of the 1960s he moved to new premises in Waddell Court. Mr Adams was a right character he was often known to give tick in the Riverside Tavern but if you missed a payment he would never give you a drink the next time you were short of cash. When John retired he moved to Spain and by chance he stumbled across a film crew who were filming a new soap for British Television, Elderado, John was given a small part in the filming of the short series which was a total flop despite spending millions of pounds on the film set. Afterwards John was involved in a car accident in Spain and was never the same afterwards. The Tavern, Ballater Street with St Luke's chapel and hall in the back ground. 1960s. Mr John Adams left with Mr W T Currie and Mr G Henderson. The occasion was at a golfers dinner of the St. Mungo's Golf Club. 1961. Mr John Adams right with Mr Jack Gow. 1972. John Adams with his wife Betty and son Jack. 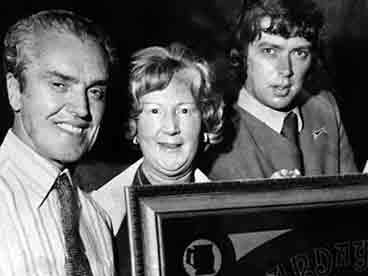 Winners of the Sunday Mail Pub of the Month 1976. Thanks to David Adams for the image. Another view of the Tavern in great need of a paint job. 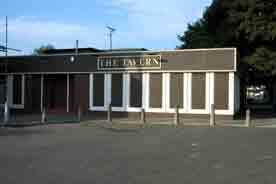 Now Called by a shorter title The Tavern. 2008. Allan Gilmour was landlord of the Tavern, Govan Street, in 1887.